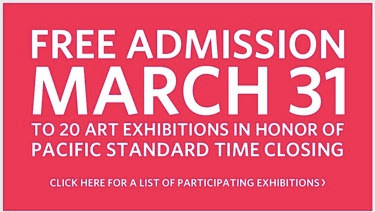 To add a celebratory shout-out to the final day of Pacific Standard Time, the participating 20 SoCal museums will be free today. Click here for more info, and go check out some very cool exhibits! How fun does this sound? The Skirball Cultural Center will be celebrating the "wonders of puppet theater" on Sunday, April 1, with a special Puppet Festival. The all-day event, which runs from 10 a.m.-4:30 p.m., will offer kids and parents the chance to make their own puppets, as well as catch performances and storytelling. Inspired by the amazing animal puppets and sculptures that populate the Noah's Ark exhibit (which CC loves! ), this festival looks like a must-do. Plus, the ticket price includes museum admission. 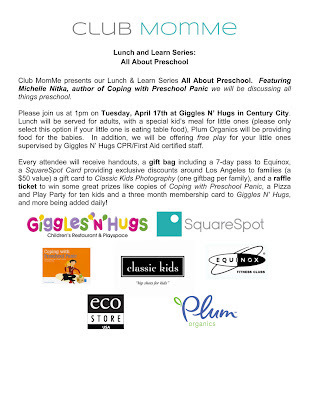 Club MomMe and Savvy Sassy Moms host a mom-friendly event at Right Start in Santa Monica. Spring is in the air, and babies seem to be appearing everywhere. At the park. At the grocery store. In the formula aisle. OK, so the last one was a little on the nose. That's why I was happy to check out a local event last night hosted by Club MomMe, a new social and educational community for moms and moms-to-be, and my friend Andrea from Savvy Sassy Moms. A group of moms (and a few nervous dads!) gathered at Right Start in Santa Monica to check out Registry 101: The Inside Info on Baby Gear. And I wanted to share with readers, who might have little ones on the way, some fun new products that have come along in the five years since I had CC. Also, I wanted to share more info about Club MomMe, which is hosting a ton of fun and informative events in the next couple of months. For starters, on April 10th, they'll be hosting another registry dinner in Manhattan Beach, and parents can get a preschool primer on April 17 at Giggles 'N Hugs in Century City. While the events do come with a price tag (starting at $35), that does include refreshments, a generous gift bag and a chance to win bigger prizes during a raffle. Some cool items I saw yesterday included the Travel Boppy ($44.99, left), a genius adaptation of the original breastfeeding helper. Also, did you know that the ubiquitous (we have one, too) Baby Bjorn (on sale at $103.99) now comes with a back support strap so your shoulders don't get too weighed down from toting Baby everywhere? And I love this counter-top drying rack for bottles, binkies and plasticware -- the Lawn ($29.99). What I didn't know was that the ultra-French baby toy Sophie the Giraffe teether (on sale for $19.99) has made quite the impact Stateside. What's especially great about this toy is that it's made from natural rubber (not plastic) and colored with food paint. Even if you don't have a little one on the way but still want to get more connected with local moms, these upcoming events are great opportunities for meeting new friends and checking out great products. Sea turtles Sammy and his friend Ray explore the oceans in "A Turtle's Tale: Sammy's Adventures." 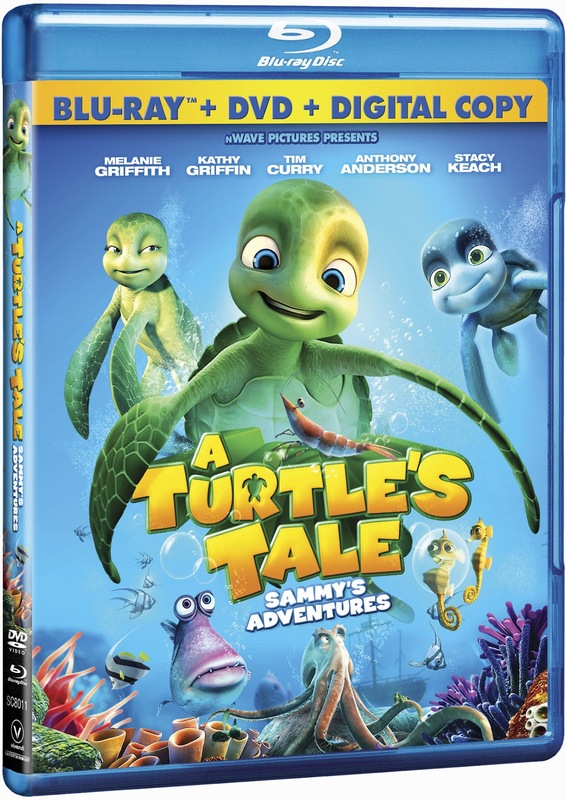 With Earth Day almost upon us, DVD/Blu-ray offering "A Turtle's Tale: Sammy's Adventures" is a wonderful way to introduce kiddos to our underwater worlds. Based on the trajectory of a sea turtle's life, this movie from Vivendi Entertainment and StudioCanal (SRP: $19.95; April 3 release) tells the story of Sammy the sea turtle and his quest to find his mate for life -- another sea turtle named Shelly, whose life he saved when he was a mere baby turtle. The story begins with an older Sammy looking back on his life, starting from the moment he hatched in Baja, California, in 1959. Making their way out of a sunken, sandy nest, a group of sea turtles head toward the Pacific in hopes of finding food and starting a life for themselves. But it's Sammy who keeps sliding down the sandy incline, back to the nest of eggs. As he struggles to pull himself up onto the level ground, a seagull nabs him, and he meets his first obstacle and learns perhaps the most important life lesson: just surviving. I watched this gorgeously animated movie with CC, half yesterday and half this morning. (She actually woke up way before breakfast so she could finish!) The 3D imagery is amazing, and the story really emphasizes exploration and perseverance -- two things I want CC to value. Granted, at times, the film can seem a bit heavy-handed when it comes to its eco-friendly message. So many obstacles that Sammy faces are the cause of human interference. But "A Turtle's Tale" also invites children and parents to consider how their actions affect our environment, even the ones that we can't see. CC also enjoyed the friendship between Sammy and his sea turtle friend Ray, as well as his search for Shelly. 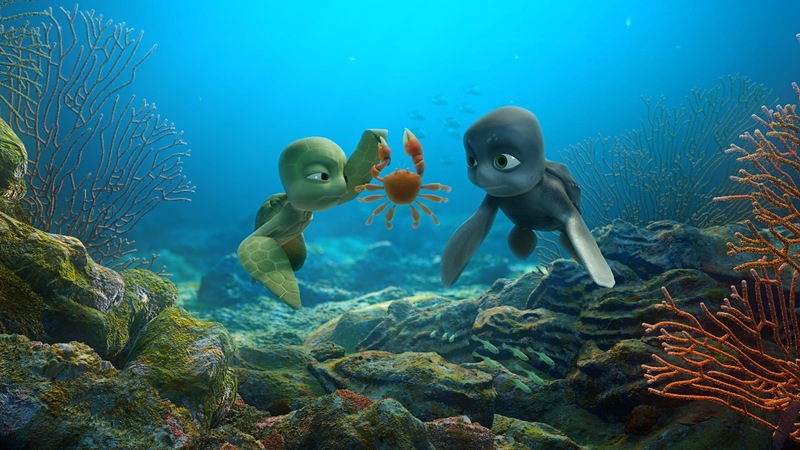 "A Turtle's Tale: Sammy's Adventures" is a lovely and visually stunning movie that helps kids to see beyond their own back yards and encourages questions about creatures who have life-changing journeys of their own. 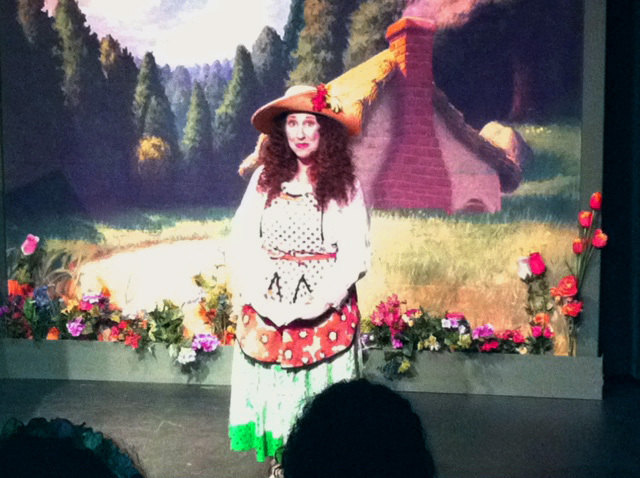 Taking a full house of children and their parents on an adventure through Faeryland on Sunday were characters like Auntie Angelica Root (pictured above), King Luke and Fauni -- colorful creatures from a local kid-favorite show, A Faery Hunt. Just like the weekend before, this past Sunday was incredibly rainy, so the interactive performance was staged indoors at the Whitefire Theatre in Sherman Oaks. Many of the Faery Hunt shows are performed outdoors (Griffith Park, Crestwood Hills Park), but the intimate theater was a cute alternative. The faeries invited the kids to sing, dance, ask questions and listen to a story about a small bud that wouldn't grow. While Auntie Angelica Root spoke in rhymes, she also sang along with the other faeries, as they tried water and jokes to make the little bud emerge from the soil. The show was adorable and (little) kid-friendly. There seemed to be a couple of technical difficulties -- that bud was being particularly stubborn -- but there were also lots of laughs and cute kids getting into the spirit with faery wings and tutus (CC and Aubrey included). I'd love to see what the outdoor performance is like. When the show was over, kids flooded the stage en masse, as the actors gladly signed autographs. Then came the actual flood, as we looked outside and saw the river formerly known as Ventura Boulevard. Tickets: $12.50-$15 per person, with kids 23 months and younger free. 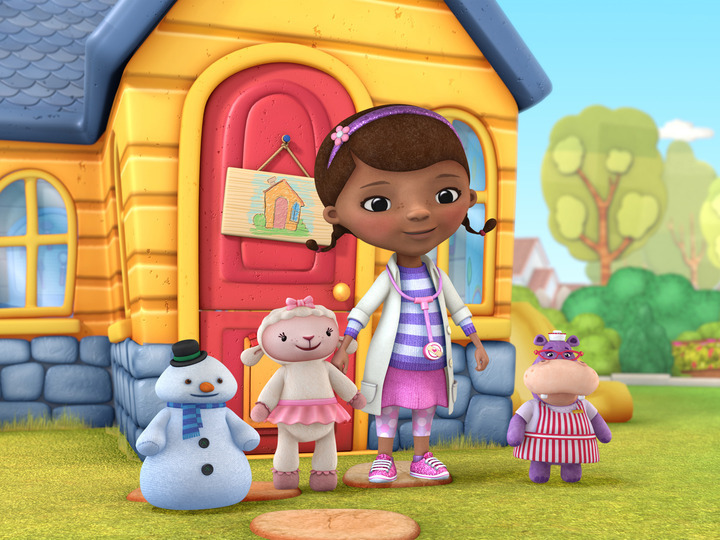 "Doc McStuffins" premiering today on the newly relaunched Disney Junior channel, is just what the doctor ordered. The half-hour weekday show, which airs this morning at 10 a.m. on the 24-hour channel for young children, is about a 6-year-old girl who treats her menagerie of adorable stuffies when they get ouchies, boo-boos and other ailments. I received a screener for the show last week, and CC loved it from the first scene. 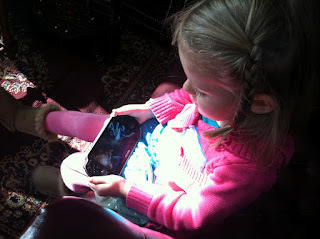 In fact, she's asked to watch it several times in the days since we've had it. Created by executive producer Chris Nee after her own experience caring for her severely asthmatic son, the show sets out to "help make everything from doctor's visits to removing a band-aid less scary for kids." What's appealing about "Doc McStuffins," especially for CC, is that this young girl takes charge in a kind, compassionate way to help her little toy friends, as well as her family, feel better. She lets kids know, through song and happy kindness, that while ouchies can hurt, they also can be treated with care. After CC watched the two screener episodes, she immediately started pretending she was a doctor herself. She listened to my heart, took notes and checked boxes in a little notebook that was included in the screener package. The bad news? Apparently my heart wasn't beating. Yikes! The good news? CC kissed and hugged me, and all was better. Last week, I had the opportunity to check out two sneak peeks of upcoming DreamWorks Animation movies: "Madagascar 3: Europe's Most Wanted"; and "Rise of the Guardians." I even caught a glimpse of special guest stars Jada Pinkett Smith (Gloria in "Madagascar 3") and Chris Pine (Jack Frost in "Rise of the Guardians"). "Madagascar 3," which arrives in theaters June 8 in both 2D and 3D, looks like lots of fun. The "Zoosters" (as directors Eric Darnell, Conrad Vernon and Tom McGrath playfully called them) pop up in Europe, looking for a way back home to the Central Park Zoo in New York. Sporting both "Naughty" and "Nice" tattoos on each huge forearm, North (aka, Santa Claus with a bit of an edge) leads a group of immortal guardians against an evil force named Pitch in "Rise of the Guardians." Seeking to push "the boundaries of animation," as they did with the hit film "How to Train Your Dragon," DreamWorks Animation Chief Creative Officer Bill Damaschke said the studio wanted to do something different with its next film. Based on the book series "The Guardians of Childhood" by William Joyce, this film centers on a group of guardians (Bunnymund, aka the Easter Bunny; Tooth, aka the Tooth Fairy; and Jack Frost) who want to protect the hopes and beliefs of children all over the world. The thing is, if children stop believing, then the guardians will cease to exist. As actor Chris Pine, who plays the searching Jack Frost, said at the preview, the characters want to protect "the beauty of childhood" and "fight against the cynicism of adulthood." The voice cast also includes a lot of high-profile names, such as Alec Baldwin (North), Hugh Jackman (Bunnymund), Isla Fisher (Tooth) and Jude Law (Pitch). CC is ready for the Searching Safari at the L.A. Zoo. After the downpour on Saturday, CC and I donned the slickest of rain gear in preparation for Sunday morning's Searching Safari at the Los Angeles Zoo and Botanical Gardens. If we were going to embark on our outdoor adventure, we were going to need umbrellas, rain coats and rain boots. But, it turns out, the weather was clear, gorgeous and sunny. Perfect for a day at the zoo! The Greater Los Angeles Zoo Association (GLAZA), which holds the annual event to celebrate patron families of the Safari Club (and invites press like me), prepared for a rainy day by hosting a continental breakfast, face painting and animal meet-and-greets indoors. After CC received a gorgeous swan on her cheek, she sidled up to the only Hawaiian Owl on the mainland (pictured above right). Apparently the little owl had stowed away on a ship headed for California. Then the families were off, searching the zoo for animals based on clues that read something like this: "I am from the island nation of Madagascar, off the southeast coast of Africa. I can live to be well over one hundred years old and feed on plants and fruits." In preparation for the rain, GLAZA wisely kept the safari indoors. Not only was it creative in case of another downpour, but it also gave families a chance to check out The LAIR (Living Amphibians Invertebrates Reptiles), a new exhibit that features habitats for "unique and endangered species." CC hops on a gecko outside The LAIR. We saw a California Kingsnake and Gila Monster in the Southwest Desert Building and a Madagascar Radiated Tortoise in the Arroyo Lagarto. After our amazing discoveries, we walked around the zoo grounds for a while, checking out mama lions, koala bears and hilarious meerkats. Finally, we hopped on the gorgeous Tom Mankiewicz Conservation Carousel. Taking a ride on a lovely unicorn capped off an animal-friendly day. I love the new GapKids collection from designer Diane von Furstenberg -- DVF for GapKids! The dresses are so colorful and have amazing patterns. In addition to the lovely print dress above (which is more like a long top to go with leggings), there are also von Furstenberg's famous wrap dresses (and wrap rompers!) but in miniature. * This night light is genius. The challenge is over. The results are in. 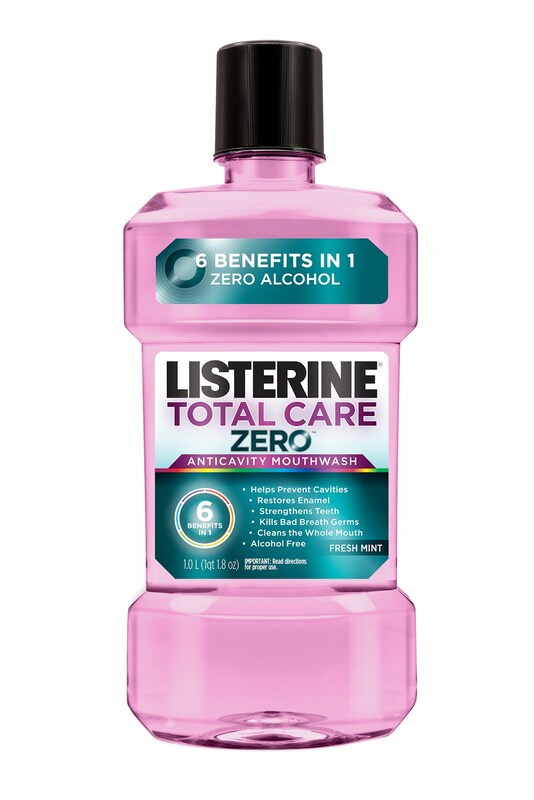 And the winner of our family's Listerine and Reach Healthy Habits for a Lifetime Oral Care Challenge is ... (drum roll, please!) CC! I have to say, I've been really proud of my 5-year-old, who flossed, brushed and rinsed twice a day, every day for three weeks! Her mom and dad? Well, I might have missed a night or two of flossing, truth be told. CC, though? Not one, and she's still going -- although I've since made flossing a once-a-day commitment for her. As I wrote in my previous Oral Care post, I was floored by studies that showed how brushing misses 75% of the particles and germs in your mouth. Also, that 50% of children ages 5-9 have a cavity or need a filling. 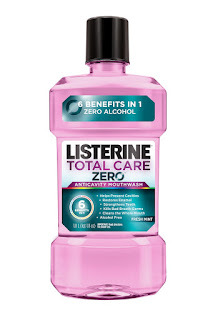 As for me, I preferred the Listerine Total Care Zero mouthwash to the regular version. The rinse wasn't as harsh because it contains no alcohol. And, believe it or not, flossing did get easier. It became a routine and also felt less harsh on my teeth. But more than anything, I'm most proud of my little girl. Now flossing, brushing and rinsing are part of her little routine. She even reminds me about it! And starting this early really helps with developing great habits over her lifetime. 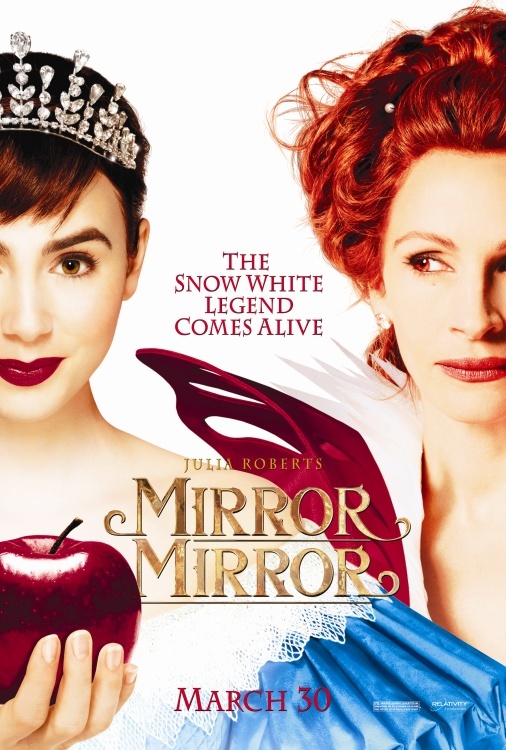 Snow White has just gotten a 21st century makeover with new film "Mirror Mirror." Opening in theaters on March 30, this retelling of the famous dwarf-loving girl offers laughs as well as Julia Roberts as the ruthless and evil queen. Lily Collins (daughter of musician Phil Collins and featured in "The Blind Side") stars as the lovely lady who is, according to press notes, "fighting to reclaim her birthright and win her prince (Armie Hammer, "The Social Network") in this magical adventure comedy filled with jealousy, romance and betrayal." Sounds like a fun movie, and I have info on how you and your own little Snow White (or Prince!) can score tickets of your own. Three screenings will be held Wednesday, March 14, at the ICM Screening Room at ICM Century City (10250 Constellation Blvd. LA, CA 90067). Visit www.gofobo.com/rsvp and enter the following codes to download free passes to one of the three screenings. Please note that preference will be given to families with children ages 14 and under. While you're browsing online, trying to find the coolest summer camp or weekend escape for the family, do you ever wish you could keep all of this info in one place? I know I do. Sometimes, I tell myself that I'll remember something (without writing it down), or I'll write it on a piece of paper that eventually gets tossed with a crumpled pile of receipts. Well, myFINDS! could be your answer. 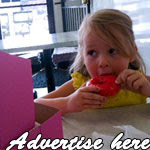 Created by people behind familyFINDS!, which offers lots of helpful local deals, myFINDS! lets you tag websites with a simple click of your mouse to create lists of fun things to do. Check out the lists I've created here and here. While my lists focus on top museums or free and inexpensive things you can do in Los Angeles, you can create a list for just about anything. And what's also great is that you can tailor it to your city! The site works a bit like Pinterest -- there are lots of great pics! -- but myFINDS! focuses more on creating a local community of parents. You can follow other moms and dads to see what they like to do in and around your hometown. Give it a try! I know I'm always looking for fun places to take CC. "Friends With Kids," written, directed, produced by and starring the very talented Jennifer Westfeldt, is not your mother's romantic comedy. The movie, which I caught an advanced screening of last week, was laugh-out-loud funny, but it was also at times heartbreakingly brutal. 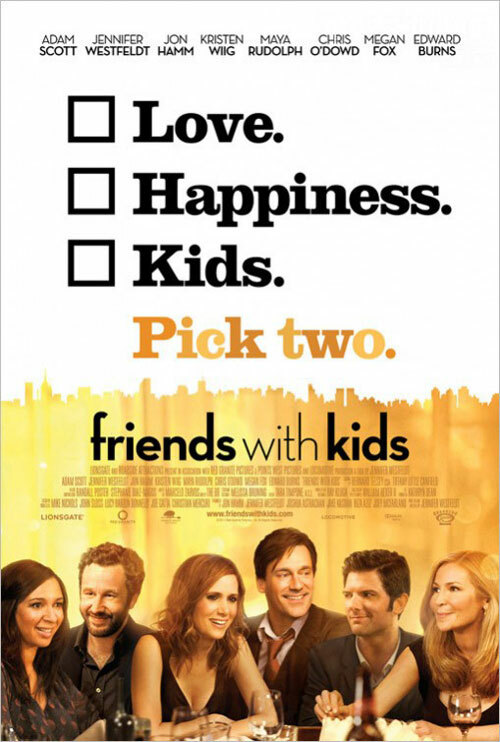 "Friends With Kids" follows a tight group of friends -- two sets of marrieds (Maya Rudolph & Chris O'Dowd, and Kristen Wiig & Jon Hamm) and two singletons (Westfeldt and Adam Scott). When the married couples eventually have kids of their own, it's the single duo who feel sidelined. But they also witness just how life-changing parenthood can be. Despite that, they still want children of their own. That is, without the boring, at-times nasty and messy element of marriage. So Julie and Jason (Westfeldt and Scott) decide to have a baby themselves -- while still being "just friends" and while dating other people. The premise itself is clever and seemed, in some ways, like an ultra-modern nod to "When Harry Met Sally." After all, the first scene has Julie calling Jason, who lives in an apartment a few floors above her, asking how he would prefer to die. This adorably neurotic conversation had the same humor and intimacy as the late-night phone calls between Sally (Meg Ryan) and Harry (Billy Crystal), who would always read the last page of a book to find out the ending in case he died before finishing. But on the flip side of that deep friendship were scenes of outright viciousness, mostly from the mouths of the marrieds. Whether it was dropping a litany of F-bombs while thundering orders (sometimes in front of their kids) or seething in silent hatred, the two couples really seemed to put the "lock" in "wedlock." Avoiding that altogether is the plan that Julie and Jason concoct, but sharing intimacy and a baby while dating other people has consequences of its own. I won't spoil the ending for you. The last line of the movie is both crude and poignant -- an emotional and romantic moment born out of an ultramodern version of that old-fashioned desire: Love. Los Angeles officially has a new rock star. The 340-ton granite megalith, aka Michael Heizer's art piece "Levitated Mass," arrived early (pre-dawn early) Saturday morning at its new home at LACMA. The rock has garnered a lot of attention in the past couple of weeks, even before it left a quarry in Riverside County on Feb. 28. According to LACMA, the huge rock has traveled (and very carefully at that) through four counties and 22 cities. It created quite a following, as people gathered to meet it and its huge transporter along the circuitous route. I wish I could have taken CC to see the boulder arrive at LACMA on Saturday, but I don't think any of us would have been very happy to leave the house at 3:30 or 4 in the morning. We're lucky, though, that so many people shot photos and videos (including the one above) of the experience. Now, I'm looking forward to taking CC to see the actual exhibit, which will have the megalith "levitating" over a 456-foot concrete-lined slot on the LACMA campus. The exhibit should open in late spring or early summer. Tonight, I'm heading to the Grove to check out an advanced screening of "Friends With Kids." It looks hilarious, so stay tuned for the full review. The film, written and directed by Jennifer Westfeldt ("Kissing Jessica Stein"), sports a great cast (some might even think it's a "Bridesmaids" reunion) and focuses on a group of friends, two of whom want to make a baby together ... while still being "just friends." Let's see what happens with that relationship! Can't wait to see Jon Hamm, Kristen Wiig, Maya Rudolph and others in a movie about parents and kiddos. The movie hits theaters tomorrow. And if you're in Los Angeles, Jennifer Westfeldt and Jon Hamm will be on hand for a Q&A after the 8 p.m. screening of the movie at the Arclight Hollywood. Click here for tickets. For some kids and parents, the sniffly season might be behind them. For others, myself included, it's still here -- tissues, stuffy noses and all. That's why I was happy to review a new talking (yes, it talks!) thermometer from Safety 1st. 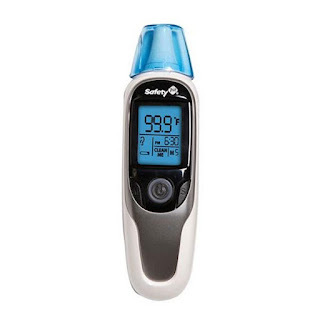 The Safety 1st VersaScan Talking Thermometer ($39.99) is genius. Now, granted, this is coming from a mother who used a thermometer that took a whopping 30 seconds to read CC's temperature. That's like light years when talking about a squirmy child. I never believed that I had exactly the right temperature because she was always off and running before it could offer its dejected beep. This thermometer? It takes just one second to get an accurate reading. Not only that, but the display shows the temperature, as well as a happy face or sad face depending on if the child (or parent) has a fever. In addition, a voice reads out the temperature and the fever light ring glows red if the temperature hits 99.6 degrees F.
This has been immensely helpful on the days when I wasn't sure if CC was feeling well. Is it just a runny nose or something more? Some other nifty features include a memory that stores up to 30 readings, as well as the ability to take the temperature of bath water or even food. I tried the thermometer on my tea, and it let me know that my decaf chai did, in fact, have a fever. Which, in that case, was fine with me. While cold season might be winding down, I'm happy to have this clever tool in my mom arsenal. In the cute pop-up shop Vita Hill Social Club, on Main Street in Santa Monica, CC got her first taste of the latest handheld gaming gadget, the PlayStation Vita, or PS Vita. Sony's new device, which sports two cameras as well as motion sensors and starts at $249, was offered up for a test drive to local SoCal bloggers, thanks to awesome moms' blogging group, MomsLA. While the kiddos indulged in all sorts of visually amazing games, the moms chatted and indulged a bit ourselves with pizza from Fresh Brothers and tasty treats from Nothing Bundt Cakes. Have you or your kids tried the PS Vita? What do you think? If you're interested in checking out the device and games on the house, find out where the next pop-up shop will appear and give it a try. When I mentioned last week that the Story Pirates were going to turn CC's animal-friendly story "Eena Met Everything" into a lively musical performance, I knew it would be fun. After all, we'd seen what the troupe had done with the life of Marie Curie. I had no idea, though, that it would make me cry. As in, laugh-out-loud, wiping-my-eyes cry! 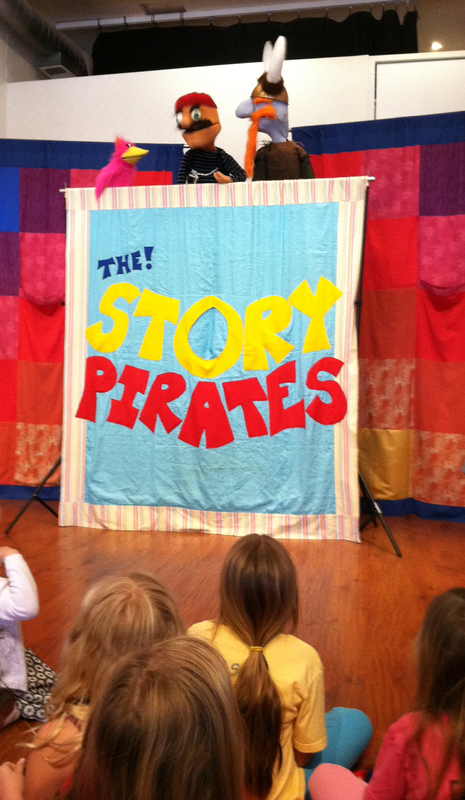 In one of their regular Saturday performances last week, the Story Pirates sang, danced and acted out several different skits -- all of them based on stories written by children. And the effect was truly magical. The above video is their performance of "Eena," and Ian and I were amazed at how faithful they were to CC's story. The characters and plot are basically the same, while the music, dialogue and other fun flourishes are all courtesy of the Story Pirates. Honestly, I think it blew CC's mind a little bit. I could tell that she was a little shy because of all the attention -- which isn't typical. In fact, I'm surprised she didn't try to go up and perform with them. In addition to their weekend performances, the Story Pirates also visit schools and work their musical magic in the classroom. "As a performer, you are given the opportunity to start assisting in the classrooms, along with our highly trained teachers, and soon after I began performing with the Pirates," he wrote. After assistant teaching and then moving out to L.A., White became a lead teacher for the school programs. In the summer of 2011, he added, "the Geffen Playhouse (where they're based) hired him to produce all 20 Title I public school programs that the Geffen funds each year." That's in addition to performing in Westwood. So how does the process work for adapting a child's story? "Adapting or 'building' a kid's story is primarily FAST," White wrote. "We have been fortunate enough to get nearly 60 LA comedians and actors who are sharp, funny and have great memories." A typical school show, he added, includes eight stories, four to five of which are written by kids at that school. "We rehearse for a total of six hours per show," he added, and then a pianist joins them for the second rehearsal. While the Pirates can't perform every child's story, they emphasize that it's not a contest. Also, they provide written feedback, called Story Love, for every child who submitted a story. "It's very important to us that every child whose story is performed takes away from the show that their words and ideas matter," White wrote. "So often kids lose sight of the purpose of writing because it only comes up in a testing environment, and we believe that the silliest, most ingenious ideas come from a fun, creative environment, where any idea is a good idea." CC is definitely a fan -- we all are. In fact, both Ian and CC have been singing one of the Story Pirates' songs, "Why Would You Do What a Dog Does?," over and over since Saturday. You can find it here on their YouTube channel. For more information about Story Pirates performances, click here. It's all Seuss, all the time starting tomorrow. Not only that, but Nucleus gallery in Alhambra is kicking off its own celebration on March 3. "Look at This, Look at That: A Tribute to Dr. Seuss" will feature more than 35 artists paying homage to Dr. Seuss through various new interpretations of his art. The event runs through March 24. And don't forget that "The Lorax" opens tomorrow in theaters! CC sure hasn't.
" 'The Cat in the Hat Knows a Lot About That!' is designed to help young children learn core science skills to prepare them for success in school -- while taking them on Seussian adventures that inspire their curiosity," said Lesli Rotenberg, senior vice president of children's media at PBS, in a statement. CC loves the show, which is one that encourages her to ask lots of questions. Great for any little explorer! 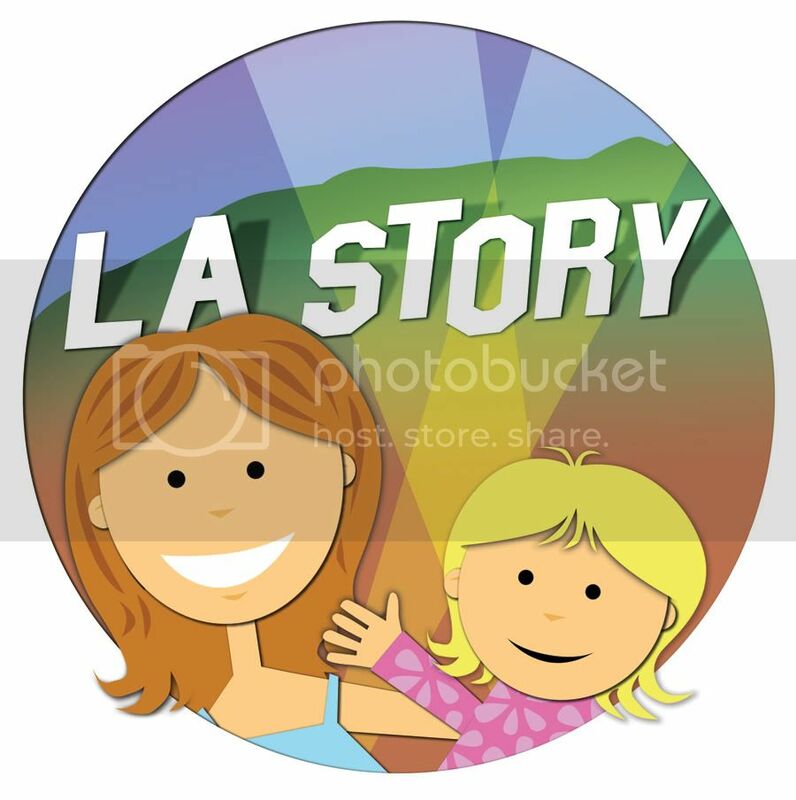 If you're a Twitter fan -- I'm at @la_story -- stop by the social-media site tonight from 6 p.m.-7 p.m. PT. PBS KIDS is hosting a "Cat in the Hat"-themed Twitter party with Random House that will feature cool offerings. I'll be there, too! Find us at the hashtag #cithathon. Whatever you choose, have a wonderful Seussian weekend!